As the weather changes, our bodies feel like we’re being pulled in various directions. A constant stuffy nose runs amuck, and even though we are inclined to attribute this to bad allergies, it ends up that we’re actually talking about chronic sinus infections. Pain in your sinuses is rather high, you’re dragging, and we have made these symptoms part of just another bad allergy season. This highlights one major point — most folks can’t tell the difference between bad allergies and a serious sinus infection. Though that is alarming enough, very few will touch base with their doctor & only taking OTC medication to alleviate their symptoms rather than find out what is actually causing a problem. For starters, inflammation is found in the nasal areas of your face. The inflammation causes some rather large amounts of mucus to fill up nasal cavities, which causes some serious pressure. This, then, induces the complaints of headaches and pain in the face, which are the red flags that are missed by many men and women. 1 thing that should always be remembered is that the human body is an incredible creation that will let us know almost immediately when something is not perfect. Pain is one way we are being told that we will need to have things checked out. Something else people miss seeing chronic sinus infections is they begin to attribute their high quantity of fatigue to everything but a sinus infection. When you take under account the high amounts of swelling and pressure in your face and nasal passages, being able to breathe adequately will be compromised. This, in turn, makes laying down and sleeping more difficult to do because you are not able to draw air in an effective manner. Sleep deprivation is never a wholesome part of everyday living, and it ought to be quite high on the list of things which should concern you enough to seek medical advice. One final thing of note we alluded to slightly is that we often confuse a chronic sinus disease with something else such as bad allergies, a cold, or the flu. A pretty good way of knowing when to consider a sinus infection is a cold or influenza typically last about a week or so. If your symptoms persist beyond that time frame, it’s likely not one of those causing difficulties. 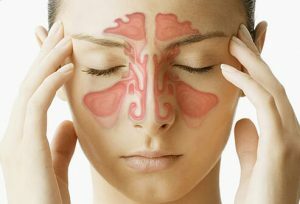 Also, sinus infections might not actually have a tell-tale markers like mucus production when blowing your nose because the congestion is either further in the nasal passages or may be directly connected to swelling of the passages making it harder to breathe. A chronic sinus disease is no time to play self-diagnostician. If you suffer from anything mentioned above and there’s absolutely no improvement within a week or so, see your physician.